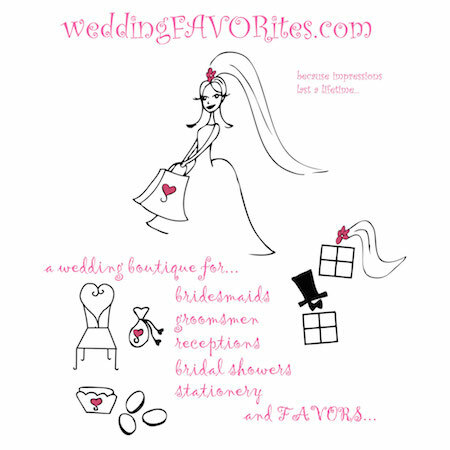 Wedding Favorites is proud to have been featured in the most popular wedding planning magazine consistently over the years. Our features in Modern Bride, Brides, and Martha Stewart Weddings, make us proud of being part of a vibrant and creative industry. We strive to make our customers' events spectacular, and we do so with a combination of an eye for the latest trends and also excellent customer service. Since you've decided to shop here, rest assured, planning your celebration just got easier! Whether it’s a wedding, bridal shower, baby shower or birthday party, we’ve got the stylish designs you’re looking for to match your party theme! We have been dedicated to offering unique and modern wedding favors and baby shower favors. We design many of our own collections of party favors with detail and knowledge of the latest trends, while creating unique wedding favors that will last. Our stylish product line of personalized favors and DIY items will help any busy party planner in their process, no matter the occasion! Our designer and owner Hina Khan is involved in the creation of each and every product. Hina has been a creator and artisan since 2000 when she began designing wedding favors and gifts in her apartment after she graduated from UCLA. She takes extreme pride in her role in not only designing all of our products, but photographing all of our images.